Corero Network Security international president André Stewart has stepped down from the firm to pursue outside opportunities as pre-tax losses for the six months to 30 June widened substantially. Former Corel boss Kris Hagerman is to join Sophos as CEO, replacing Steve Munford, who is stepping down after seven years in charge to spend more time with his family. Our weekly run down of the top 10 most read stories on MicroScope.co.uk. 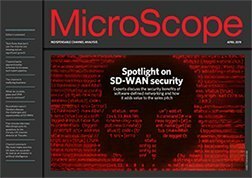 Network security software specialist Stonesoft says more needs to be done to tackle the threat of Advanced Evasion Techniques and is calling on its channel to help. Security firm Bitdefender has announced a new distribution deal with VAD e92plus, extending the reach of Bitdefender's virtualisation anti-malware technology in the UK channel. Fortinet’s channel partner programme is undergoing a further evolution that will see some partners demoted after the firm identified a need to manage its scheme more effectively. A Forrester Research survey commissioned by IBM has found that nearly 70% of end users neglect IT security because other responsibilities keep them too busy. Network security newcomer FireMon has picked Azlan to lead an assault on the UK VAR and managed service provider market. Corero has said its strategy in the security sector is clearly paying off, but its DDoS business still grew at a slower rate than its software unit.